Alloimmunity to mismatched donor HLA-Ags and autoimmunity to self-Ags have been hypothesized to play an important role in immunopathogenesis of chronic rejection of transplanted organs. However, it is not known what role, if any, alloimmune response plays in inducing autoimmunity. To test whether Ab-developed posttransplantation to mismatched donor MHC induces autoimmunity and chronic rejection, we developed a murine model wherein anti-MHC class I Abs or control (C1.18.4/anti-keratin) were administered intrabronchially into native lungs. 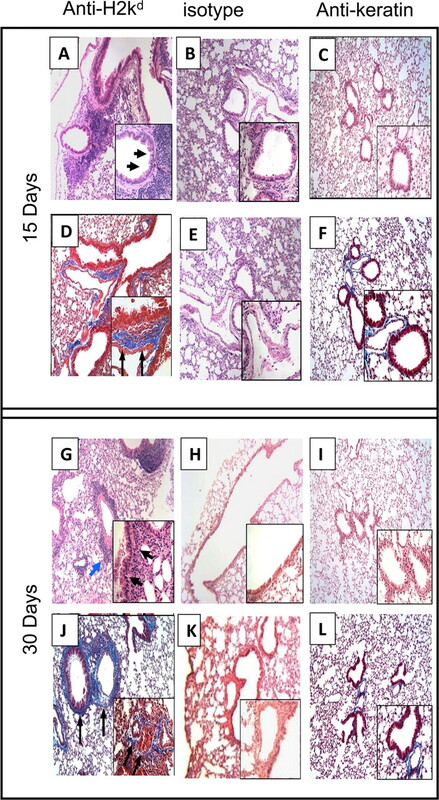 Animals receiving anti-MHC class I, but not control Abs, developed marked cellular infiltration around vessels and bronchiole of lung by day 15, followed by epithelial hyperplasia, fibrosis, and occlusion of the distal airways similar to chronic rejection following human lung transplantation. Lungs of mice receiving anti-MHC class I showed increased expression of chemokines, their receptors, and growth factors, and induced IL-17 as well as de novo Abs to self-Ags, K-α1 tubulin, and collagen V. IL-17 neutralization by anti-IL-17 resulted in reduction of autoantibody and lesions induced by anti-MHC class I Abs. Thus, our results indicate that Abs to donor MHC can induce autoimmunity, mediated by IL-17, which plays a pivotal role in chronic rejection postlung transplantation. Therefore, approaches to prevent autoimmunity should be considered for the treatment of chronic rejection postlung transplantation. Transplantation is the current treatment of choice for many end-stage renal, hepatic, cardiac, and pulmonary diseases. Improvement in surgical techniques, postoperative management, and immunosuppression have all resulted in marked improvement in allograft survival. However, long-term functions of the transplanted organs are often limited due to development of chronic rejection. This is particularly true following lung transplantation (LTx),3 in which chronic rejection, referred to as bronchiolitis obliterans syndrome (BOS), occurs in 50% of the transplants within 3 years posttransplant. A retrospective analysis of 2190 transplants performed at Washington University/Barnes Hospital demonstrated that nearly all of the transplanted organs succumb to chronic rejection during the course of 10 years posttransplant (1). It is generally accepted that chronic rejection is a manifestation of alloimmune responses against the transplanted organ (2, 3). More recently, strong correlation has been noted for the development of anti-MHC class I Abs during the posttransplant period with development of chronic rejection (4, 5). A longitudinal study conducted over a 10-year period for HLA Abs demonstrated a strong association between the production of HLA Abs after renal transplantation and graft failure (6). Similar association of posttransplant Abs with rejection of heart (7)and LTx (8) has also been reported. Based upon these reports, it is generally believed that HLA Ab monitoring during the posttransplant period is an effective way to predict impending chronic rejection of solid organs. Induction of autoimmunity following allotransplantation has also been demonstrated after heart transplantation and LTx (9, 10). It has been postulated that autoreactive T cells to self-Ags occur after an alloresponse, and once activated they can induce pathology of chronic rejection (11). Cellular autoreactivity against heat shock protein 60 (HSP-60) has been demonstrated in peripheral blood and graft-infiltrating lymphocytes following renal transplantation (12). These cells produced both inflammatory and regulatory cytokines in response to HSP-60, and IL-10 predominance was noted in the late period posttransplant, suggesting a regulatory role for HSP-60 autoreactivity. Cardiac myosin-reactive T and B cells have been demonstrated following murine cardiac allograft rejection (9). Furthermore, anticardiac myosin immune response has been shown to contribute to the graft rejection in that pretransplant modulation of this response in recipient mice can affect cardiac allograft survival (13). It has been demonstrated that anticardiac myosin reactivity persists in the late posttransplant period in the absence of an alloimmune response, suggesting that the autoimmune response to myosin may be associated with the pathogenesis of chronic rejection (14). Furthermore, pretransplant sensitization with cardiac myosin resulted in accelerated rejection of the graft, and more significantly under the same condition, even a syngenic graft was rejected within 40 days (9). Using a rat model of LTx, evidence has been obtained for an immune response to a self-Ag, collagen V (ColV), in the pathogenesis of lung allograft rejection (15). Two lines of evidence supporting the view that autoreactive T cells specific to ColV are sufficient to cause rejection of the transplants have been presented, as follows: 1) instillation of syngenic BAL cells pulsed with ColV was sufficient to cause rejection of lung allograft, and 2) adoptive transfer of anti-ColV cell lines into naive rats caused peribronchiolar and perivascular inflammation in lung isografts (16). Taken together, the above experiments using animal models of transplantation strongly support the conclusion that the induction of an autoimmune response after transplantation may lead to chronic rejection of allografts. IL-17 has been to shown to be a potent proinflammatory cytokine that acts on epithelial cells, endothelial cells (ECs), fibrocytes, and stromal cells, leading to a proinflammatory signal that results in enhanced proinflammatory cytokine and chemokine secretion (17). IL-17 has also been shown to play a crucial role in the induction of humoral autoimmune responses (18). Analysis of the T cell responses to ColV in LTx recipients has been shown to be dependent on CD4 T cells and monocytes (19), and this response was found to be dependent on IL-17, TNF-α, and IL-1β (19). Furthermore, this report demonstrated the interaction between IL-17 and monocytes is necessary for the induction of the ColV-specific responses that correlates with the development of BOS. Studies in the literature have also demonstrated that a deficiency in the IL-17 or blocking of IL-17 results in a decrease in the production of autoantibodies (20, 21). IL-17 has been also shown to play a crucial role in the formation of germinal centers (GCs) and regulate the movement of the B cells in the GCs as mediated by chemokines CXCL12 and CXCL13. Blocking of the IL-17 has been shown to result in a reduction in the levels of GCs and decreases the titer of autoantibodies (22). Taken together, several bodies of evidence strongly support the hypothesis that IL-17 may be an important contributor in the production of autoantibodies. Although there is strong evidence for both allo- and autoimmune responses in the pathogenesis of chronic rejection, the relationship between alloimmunity and autoimmunity and its role in the pathogenesis of chronic rejection still remains to be elucidated. In our study, we administered anti-MHC class I Abs intrabronchially into the native murine lung so that anti-MHC class I Abs will specifically ligate MHC molecules in the lung parenchyma. Using this novel model, we demonstrate for the first time that ligation of anti-MHC class I Abs to the lung parenchyma results in an autoimmune response leading to endotheliitis, cellular infiltration, epithelial hyperplasia, and fibrosis, as well as luminal occlusion of the small airways. Histopathology of the lesion closely resembles chronic rejection pathology noted following human LTx, thus providing support for both alloimmunity and autoimmunity in the immunopathogenesis of chronic rejection following LTx. Furthermore, our data demonstrates that binding of MHC molecules with specific Abs can result in exposure of self-Ags of the epithelial cells to immune system, leading to both cellular and humoral autoimmunity and immunopathogenesis of chronic rejection that is predominantly mediated by the IL-17-producing cells. We developed a murine model in which obliterative airway disease, correlate of BOS, takes place in the distal airways following ligation of MHC molecules in the lung by a mAb to MHC class I Ags. Because we wanted to have good titer of anti-MHC class I Ab in the lung and not absorbed by other tissues, we opted to give anti-MHC class I Abs directly into the lung. All experiments were performed in compliance with the guidelines of the Institutional Laboratory Animal Care and Use Committee of Washington University School of Medicine (protocol 20070121). Murine mAb to H2Kd (BALB/c, 6 wk, male, IgG2a), which has no detectable endotoxin as measured by Limulus amebocyte lysate assay, was given at a dose of 200 μg/administration into mice intubated with a 20-gauge catheter. Similarly, a murine mAb to H2Kb (C57BL/6, 6 wk, male, IgG2a) as well as murine mAb against the HLA class I molecules (HLA-A2 transgenic C57BL/6 mice, 6 wk, male) were administered endobronchially to test the ability of anti-MHC Abs to induce lesions in other strains of mice. In brief, each mice was anesthetized, and the tongue was pulled out. A mosquito clamp was inserted into the mouth, and a 20-gauge catheter was placed into the trachea. Ab (200 μg) was administered into the lung on days 1, 2, 3, and 6, and then weekly thereafter. C1.18.4, same isotype, was given on the days mentioned above as controls. Frozen lung samples were embedded in Freez Tissue matrix (OCT), and sections were cut at 5 μm thickness. The sections were fixed in cold alcohol for 2 min (−20°C) and air dried. The sections were treated with 3% H2O2 in EtOH for 10 min to block endogenous peroxidase activity. The sections were blocked with biotin/avidin system components for 15 min by blocking reagent (Avidin/Biotin Blocking Kit; Vector Laboratories). Primary and secondary Abs were diluted with Ab dilution solution (BD Biosciences). The sections were incubated overnight (O/N) at 4°C with purified rat anti-mouse CD4, CD8, CD11b, and CD19 mAbs (5.0 μg/ml; BD Pharmingen). Then, the sections were incubated for 30 min at room temperature (RT) with diluted biotin-conjugated goat anti-rat IgG (1:50; BD Pharmingen). The sections were incubated with streptavidin-HRP and incubated for 30 min at RT (BD Pharmingen). The presence of positive cells was detected with the diaminobenzidine substrate kit (BD Pharmingen), counterstained with hematoxylin, and examined using a light microscope. Positive cells were counted by random sampling. Lungs were fixed in 10% formaldehyde. Sections were cut at 5 μm thickness and stained with Masson’s trichrome and H&E. Lesions that displayed cellular infiltration, epithelial abnormalities, and fibro proliferation were analyzed by random sampling. Percentage of fibrosis was calculated using Optimas software version 6.5.172 (Media Cybernetics). Percentage of fibrosis was quantified by dividing the total area enclosed by basement membrane. Percentage of cellular infiltration and epithelial abnormalities was calculated by dividing the total bronchiole and vessel, respectively. To determine chemokines and their receptors, lungs were harvested at 4 and 15 days after treatment, respectively. Expression of 96 genes, including chemokines, their receptors, and growth factors, was analyzed by RT2 Profiler PCR Array for mouse chemokines and receptors and RT2 Profiler PCR Array for mouse growth factor (SuperArray). Lung tissues were homogenized with TRIzol reagent (Life Technologies), and total RNA was isolated. cDNA was synthesized by extension of primers using the ReactionReady First Strand cDNA Synthesis Kit (SuperArray). Lung tissues were mechanically cut and stirred in a suspension of RPMI 1640 medium (Invitrogen) supplemented with HEPES buffer (25 mM), sodium pyruvate (1 mM), nonessential amino acid (100 μM), penicillin (100 U/ml), and streptomycin (100 μg/ml), along with 0.1% collagenase type XI (Sigma-Aldrich) and 0.002% DNase (Sigma-Aldrich) for enzymatic digestion O/N at RT. The suspension was filtered through a cell strainer and washed with PBS twice. Lymphocytes were separated using Ficoll-Paque density centrifugation. Buffy coat enriched in lymphocytes was collected and washed with PBS twice. Lymphocytes isolated from lung tissues were suspended in medium. ELISPOT assays were performed, as described previously (23). Briefly, MultiScreen 96-well filtration plates (Millipore) were coated O/N at 4°C with 5.0 μg/ml capture mouse cytokine-specific mAb (BD Biosciences) in 0.05 M carbonate-bicarbonate buffer (pH 9.6). The plates were blocked with 5% BSA for 2 h and washed three times with PBS. Subsequently, 3 × 105 cells were cultured in triplicate in the presence of ColV (20 μg/ml) or human K-α1 tubulin (1 μg/ml) and irradiated feeder autologous splenocytes (1:1 ratio). After 48–72 h, the plates were washed three times with PBS and three times with 0.05% PBS/Tween 20. Then, 2.0 μg/ml biotinylated mouse cytokine-specific mAb (BD Biosciences) in PBS/BSA/Tween 20 was added to the wells. After an O/N incubation at 4°C, the plates were washed three times, and HRP-labeled streptavidin (BD Biosciences) diluted 1/100 in PBS/BSA/Tween 20 was added to the wells. After 2 h, the assay was developed with 3-amino-9-ethylcarbazole substrate reagent (BD Biosciences) for 5–10 min. The plates were washed with tap water to stop the reaction and air dried. Spots were analyzed in an ImmunoSpot Series I analyzer (Cellular Technology), and the results were expressed as spots per million cells ± SE. Any spots obtained by culturing T cell lines with APCs alone without ColV or human K-α1 tubulin were subtracted from the number of spots in the test cultures. ELISA plate (Nunc) was coated with pure ColV (BD Biosciences; 1 μg/ml) in PBS O/N at 4°C. Serum samples were collected from mice treated with anti-H2Kd Ab or isotype Ab and nontreated mice. Serum samples were tested (1:250 and 1:500) for binding to ColV. Detection was done with anti-mouse IgG, IgM-HRP, and development using tetramethylbenzidine substrate and read at 450 nm. A sample was considered as positive if the values were over an average cutoff values obtained from normal sera from 10 different mice. Concentration of Abs was calculated based on a standard curve using the binding of known concentration of anti-ColV Abs (Santa Cruz Biotechnology). ELISA to detect anti-K-α1 tubulin Abs was done in a similar manner using purified recombinant human K-α1 tubulin (1 μg/ml). Concentration of anti-K-α1 tubulin Abs was expressed as μg/ml based on a standard curve using the binding of known concentration of anti-K-α1 tubulin Abs (Santa Cruz Biotechnology). To study the role of IL-17 in induction of autoimmunity following ligation of anti-MHC class I Abs, we administered on days 1, 3, and 5, and weekly thereafter 50 μg of anti-IL-17 mAb (eBioscience) i.v. into BALB/c mice treated with anti-MHC class I Ab on days 1, 2, 3, and 6, and weekly thereafter (24). Serum from these mice was collected on day 30 following anti-MHC class I Ab treatment to quantitate the levels of Abs against K-α1 tubulin and ColV, as described earlier. Histopathological analysis of the lungs was also performed to determine the levels of cellular infiltration and epithelial hyperplasia by H&E staining. Fibrosis in the lungs was analyzed by trichrome staining. Development of anti-donor MHC Abs has been strongly associated with early development of chronic rejection in kidney (6), heart (7), and lung (8) allografts. To determine the consequences of anti-MHC class I Ab binding to the organ, we administered intrabronchially into the lungs of BALB/c mice mAb with specificity to H2Kd (anti-MHC class I Ab). C1.18.4 control Ab of the same isotype was administered in control animals. Fifteen and 30 days after administration of Abs, the lung tissue was harvested and histopathological analysis was performed. Lungs from animals administered with anti-MHC class I Ab after 15 days demonstrated significant inflammatory cells around the vessels and bronchiole (Fig. 1⇓A). In addition, there was epithelial hyperplasia (Fig. 1⇓D) and an increase in fibrosis. Morphometric analysis of these lesions demonstrated 51.4% cellular infiltration around the vessels, 71.1% cellular infiltration around the bronchiole, 71.1% epithelial hyperplasia, and 15.2% fibrosis (Table I⇓). In contrast, C1.18.4- or anti-keratin Ab-administered lungs did not show any significant lesions (Fig. 1⇓, B, C, E, and F). 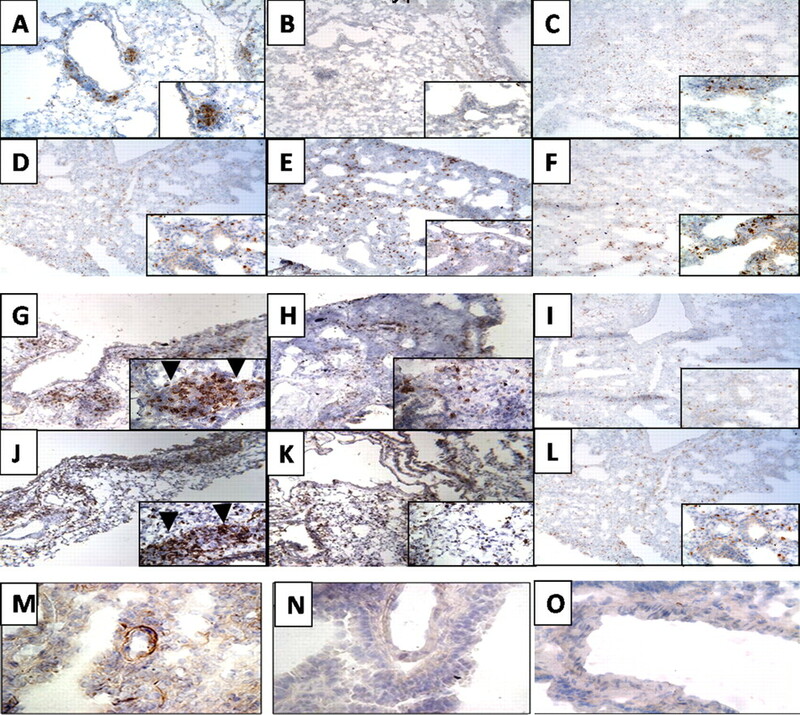 Administration of anti-MHC class I Abs developed significant cellular infiltration around vessel and bronchiole as well as hyperplasia of the bronchial epithelium (H&E stain). Anti-H2Kd or control (C1.18.4) Ab or anti-keratin Ab was administered endobronchially in BALB/c mice on days 1, 2, 3, and 6, and weekly thereafter. The lungs were harvested on day 15 or 30 and analyzed by H&E and trichrome staining. A representative picture from data obtained from five mice is presented in the figure. Original magnification, ×100; insets, ×400. A, B, C, G, H, and I, Represent sections stained with H&E; D, E, F, J, K, and L, represent trichrome staining. A and D, Anti-H2Kd-treated mice on day 15; G and J, anti-H2Kd-treated mice on day 30; B and E, C1.18.4 Ab-treated mice on day 15; H and K, C1.18.4 Ab-treated mice on day 30; C and F, anti-keratin Ab-treated mice on day 15; I and L, anti-keratin Ab-treated mice on day 30. Lungs from the anti-H2Kd Ab-treated mice showed significant cellular infiltration around bronchia and vessel (A), and hyperplasia of the bronchial epithelium (G) are marked by the arrows. A significant increase in the fibroproliferation, collagen deposition, and luminal occlusion was observed in the lungs of the anti-H2Kd Ab-treated mice (J). Mice treated with isotype control Ab or anti-keratin Ab showed no significant morphological changes compared with the anti-H2Kd Ab-treated mice (B, C, E, F, H, I, K, and L). All of the above lesions were markedly increased on day 30. Cellular infiltration around the vessels and bronchiole was increased to 93.1 and 81.8%, respectively (Fig. 1⇑G and Table I⇑). More significant is our finding of an increase in fibrosis (35.4%) (Fig. 1⇑J) along with 14.6% lumen occlusion of the small airways (Fig. 1⇑J and Table I⇑). Lungs from animals treated with control C1.18.4 Ab or the anti-keratin Abs did not demonstrate any of the above changes (Fig. 1⇑, H, I, K, and L). Similarly, administration of anti-H2Kb Abs into the C57BL/6 mice or the W6/32 Abs in the HLA-A2 transgenic C57BL/6 mice resulted in epithelial hyperplasia, induction of fibrosis, and occlusion of the small airways with a similar kinetics as observed in the anti-H2Kd-administered BALB/c mice (data not shown). Moreover, histopathological analysis of the other organs, i.e., kidney, heart, liver, and pancreas, showed no significant morphological changes following administration of the anti-MHC class I Abs (data not shown). Immunohistochemical staining of the cellular infiltration demonstrated a predominance of CD4+ cells (Fig. 2⇓, A and G, and Table I⇑) along with CD11b+ (Fig. 2⇓, D and J, and Table I⇑) macrophages around the bronchiole on days 15 and 30. In addition, a small percentage of CD8+ T cells was seen around the vessel, but not around the bronchiole when compared with controls treated with C1.18.4 (Fig. 2⇓, B, E, H, and K) or anti-keratin-Ab-administered mice (Fig. 2⇓, C, F, I, and L). Ab binding and complement deposition (C4d) on the lung parenchyma were noted (Fig. 2⇓M) in anti-H2Kd-treated mice, whereas no C4d deposition was observed in the controls (Fig. 2⇓, N and O). Administration of anti-MHC class I Abs induces significant increase in the CD4+ and CD11b+ cells in the lungs. Anti-H2Kd (A, D, G, J, and M) or control (C1.18.4) Ab (B, E, H, K, and N) or anti-keratin Ab (C, F, I, L, and O) was administered endobronchially in BALB/c mice on days 1, 2, 3, and 6, and weekly thereafter. The lungs were harvested on day 15 or 30 and analyzed for infiltration of CD4+ T cells, CD11b, and C4d deposition by immunohistochemistry using mouse anti-CD4, anti-mouse CD11b Abs, and anti-mouse C4d Abs. CD4+ cells infiltrated around the bronchiole (arrowhead) and vessel at both 15 and 30 days (A and G), along with significant infiltration of CD11b+ cells around the bronchiole (arrowhead) and vessel at 15 and 30 days (D and J) in anti-H2Kd-administered mice, whereas no cellular infiltration around the bronchiole and vessel was observed in isotype control (B, E, H, and K) or anti-keratin Ab-administered mice (C, F, I, and L). A significant increase in the C4d deposition was observed in the lungs of anti-H2Kd-administered mice (M) when compared with control Ab-administered mice (N and O). A significant increase in the levels of CD4+ T cells and CD11b+ cells was observed in the lungs of mice treated with anti-H2Kd Ab compared with mice treated with isotype control Ab. K-α1 tubulin- and ColV-specific T lymphocytes that infiltrate the lung following administration of anti-MHC class I Abs were enumerated. T cells were isolated from lung tissue at 15 days after anti-MHC class I Ab administration and stimulated with K-α1 tubulin or ColV in the presence of autologous splenocytes. As shown in Fig. 3⇓, A and B, anti-MHC class I Ab-administered animals had a significant increase in K-α1 tubulin- and ColV-reactive T cells in comparison with C1.18.4-administered animals. These autoreactive T cells include K-α1 tubulin-reactive cells capable of secreting IFN-γ (80.0 vs 43.3) and IL-4 (33.9 vs 0), and Col V-reactive cells secreting IFN-γ (71.1 vs 17.2) and IL-4 (44.2 vs 0). The response of T cells isolated from the lungs on day 30 both against K-α1 tubulin and ColV, respectively, was significantly elevated, as follows: IFN-γ (171.1 vs 65.0), IL-4 (38.3 vs 6.3), IFN-γ (101.4 vs 28.6), and IL-4 (45.1 vs 5.0). This observation indicates that administration of anti-MHC class I Abs increases the activation of autoimmune responses against the self-Ags, ColV and K-α1 tubulin. Administration of anti-MHC class I Ab increases the frequency of IFN-γ-, IL-4-, and IL-17-secreting T cells against K-α1 tubulin and ColV in the lung. A, Frequency of the IFN-γ-secreting T cells against K-α1 tubulin and ColV. B, Frequency of the IL-4-secreting T cells against K-α1 tubulin and ColV; C, frequency of the IL-17-secreting T cells against K-α1 tubulin and ColV. Anti-H2Kd or control Ab was administered endobronchially in BALB/c mice on days 1, 2, 3, and 6, and weekly thereafter. The lungs were harvested on days 15 and 30. T cells infiltrating the lungs were harvested by collagenase digestion, and the frequency of T cells secreting IFN-γ, IL-4, and IL-17 on stimulation with K-α1 tubulin and collagen was analyzed by ELISPOT. The values are represented as means ± SD using data obtained from five ELISPOT assays. , Represent the isotype control; patterned bars, represent the T cells isolated from lungs on day 15; and ▪, represent the T cells isolated on day 30. A significant increase in the frequency of IFN-γ-, IL-4-, and IL-17-secreting T cells against K-α1 tubulin and ColV was observed in mice administered anti-H2Kd Ab when compared with controls (∗, p < 0.05; control vs anti-MHC class I Ab). T cells, isolated from lung tissue at 15 and 30 days, after anti-MHC class I Ab administration and stimulation with K-α1 tubulin or ColV in the presence of autologous splenocytes, were analyzed by ELISPOT to enumerate the frequency of IL-17-secreting T cells. As shown in Fig. 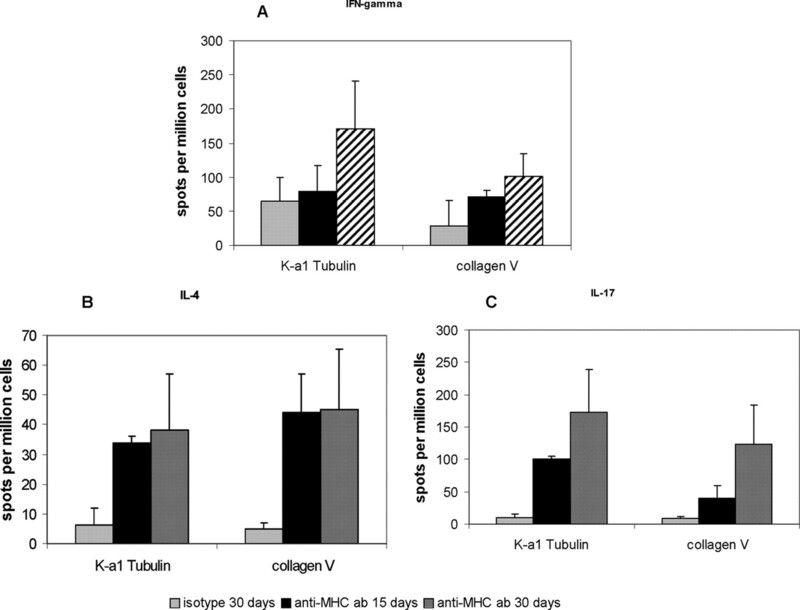 3⇑C, anti-MHC class I Ab-administered animals had a significant increase in K-α1 tubulin/ColV-reactive T cells in comparison with C1.18.4-administered animals, indicating that autoreactive T cells include cells capable of secreting IL-17 at 15 days (101.1 vs 13.6 for K-α1 tubulin, and 39.2 vs 0 for ColV in anti-MHC class I Ab compared with isotype control, respectively) and at 30 days (173.0 vs 10.3 for K-α1 tubulin, and 123.7 vs 8.2 for ColV). Because marked cellular infiltration and epithelial hyperplasia were seen following the administration of anti-MHC class I Abs into the lung, we analyzed for up-regulation of the genes for chemokines and their receptors that may be involved in promoting cellular infiltration into the lung and causing epithelial hyperplasia. As shown in Fig. 4⇓A, lungs harvested on day 4 following treatment with anti-MHC class I Ab showed a several fold increase in relation to C1.18.4 in the expression of results in an increased expression of CCL9 (9.2-fold, p < 0.01), CCR2 (10.6-fold, p < 0.01), CXCL1 (6.35-fold, p < 0.01), and CXCL12 (8.0-fold, p < 0.01). Other genes analyzed in this panel, which include genes for CC, CXC motif ligands, and their receptors, did not demonstrate any significant change in comparison with C1.18.4-treated animals. Administration of anti-MHC class I Abs increases the expression of chemokines, cytokines, and growth factor in the lungs. A, Expression levels of chemokines and their receptors. B, Expression levels of the cytokines. C, Expression levels of the growth factor. Anti-H2Kd or control Ab was administered endobronchially in BALB/c mice on days 1, 2, 3, and 6, and weekly thereafter. The lungs were harvested on days 4 (chemokines) and 15 (cytokines and growth factor) and analyzed using a quantitative real-time PCR array. RNA was extracted from the lung tissue, and 1 μg of the RNA was reverse transcribed and used as template for the quantitative real-time PCR array (chemokines and receptor PCR array, common cytokines PCR array, and growth factor PCR array; Superarray). Cycle threshold values obtained from the quantitative real-time PCR were analyzed by using the PCR array analysis software from Superarray. The samples were normalized using the expression levels of the housekeeping genes GAPDH and hypoxanthine phosphoribosyltransferase 1. The data represent the average values obtained from three different experiments. A significant (p > 0.05) increase in the expression of chemokines (CCL9, 9.2; CCR2, 10.6; CXCL1, 6.35; and CXCL12, 8.0), cytokines (IL-10, 4.0; IL-12b, 5.66; IL-17f, 12.17; Inhba, 13.0; Tnfsf11, 6.5; Tnfsf15, 8.0; Tnfsf 4, 21.11; CD40 lg, 5.28), and growth factors (Bmp6, 4.30; Bmp8a, 10.88; Bmp8b, 5.28; Fgf6, 5.07; Fgf2, 37.46; and IL-4, 290.82) was observed in mice administered anti-H2Kd compared with controls. To analyze the genes that are activated following anti-MHC class I Ab treatment, the expression of 96 cytokine genes in lymphocytes purified from lung tissues treated with anti-MHC class I Ab and C1.18.4 at 15 days after treatment were determined by RT2-PCR array. As shown in Fig. 4⇑B, lymphocytes purified from lung tissues treated with anti-MHC class I Ab showed a significant increase in the expression of IL-10, 4.0-fold; IL-12b, 5.66-fold; IL-17f, 12.17-fold; Inhba, 13.0-fold; Tnfsf11, 6.5-fold; Tnfsf15, 8.0-fold; Tnfsf 4, 21.11-fold; and CD40 lg, 5.28-fold. Lungs harvested on day 30 postadministration of anti-MHC class I Abs demonstrated significant fibrosis and luminal occlusion of the bronchioles. To determine the growth factors that may be involved in this process, we analyzed expression of 96 well-known growth factor genes in lungs harvested after 15 days of administering either anti-MHC class I or control Ab C1.18.4. As presented in Fig. 4⇑C, lungs treated with H2Kd demonstrated significant fold increase in the expression of many growth factors, including Bmp6, 4.30-fold; Bmp8a, 10.88-fold; Bmp8b, 5.28-fold; Fgf6, 5.07-fold; Igf2, 37.46-fold; and Ngfb, 290.82-fold. Development of autoantibodies against ColV and K-α1 tubulin has been demonstrated in LTx recipients with chronic rejection, as well as in animal models of lung allograft rejection (25). To determine whether anti-MHC class I Ab administration into the lung can result in autoantibody formation, we analyzed serial serum samples from the animals that developed lesions similar to chronic rejection following human LTx. As shown in Fig. 5⇓A, 30 days post-anti-MHC class I Ab administration, mice reacted with tubulin. In addition, sera obtained at 15, 30, and 60 days post-anti-MHC class I Ab administration also reacted to another self-Ag, ColV (Fig. 5⇓B). These results concur with earlier findings from both human and animal LTx studies indicating that autoantibodies to self-Ags may play a role in the pathogenesis of chronic rejection. Furthermore, our results indicate that anti-MHC class I Abs can indeed expose otherwise cryptic Ags, and immune responses to these Ags can be elicited following the development of anti-donor MHC Abs. Administration of anti-MHC class I Abs leads to development of autoantibodies against self-Ags K-α1 tubulin and ColV. Anti-H2Kd or control Ab was administered endobronchially in BALB/c mice (n = 5 each) on days 1, 2, 3, and 6, and weekly thereafter. Sera were collected from the mice on days 15, 30, and 60. ELISA was performed for Abs to self-Ags in the serum of mice treated with anti-MHC Abs or control Abs using purified K-α1 tubulin or ColV as Ag. Administration of anti-H2Kd Ab results in the increased concentrations of anti-K-α1 tubulin (A)- and ColV (B)-specific Abs on days 15, 30, and 60 compared with control mice treated with C1.18.4 Abs. IL-17 is a pleiotropic cytokine implicated in autoimmune disorders and in development of autoantibodies. To determine the role of IL-17 in the mechanism by which anti-MHC class I Abs induce autoimmunity, we administered neutralizing anti-IL-17 Abs (eBioscience) or control Abs (50 μg) i.v. on day 1, 3, and 5, and weekly thereafter into BALB/c mice administered anti-H2Kd Abs endobronchially. Analysis of the sera from these mice collected on day 30 showed a significant reduction in the development of autoantibodies against K-α1 tubulin and ColV by ELISA similar to the levels observed in the control Ab-treated mice (Fig. 6⇓A). More significantly, histopathological analysis of the lung showed a significant reduction in the levels of cellular infiltration, epithelial hyperplasia, and fibrosis (Fig. 6⇓B) compared with those animals treated with anti-MHC class I Ab alone. 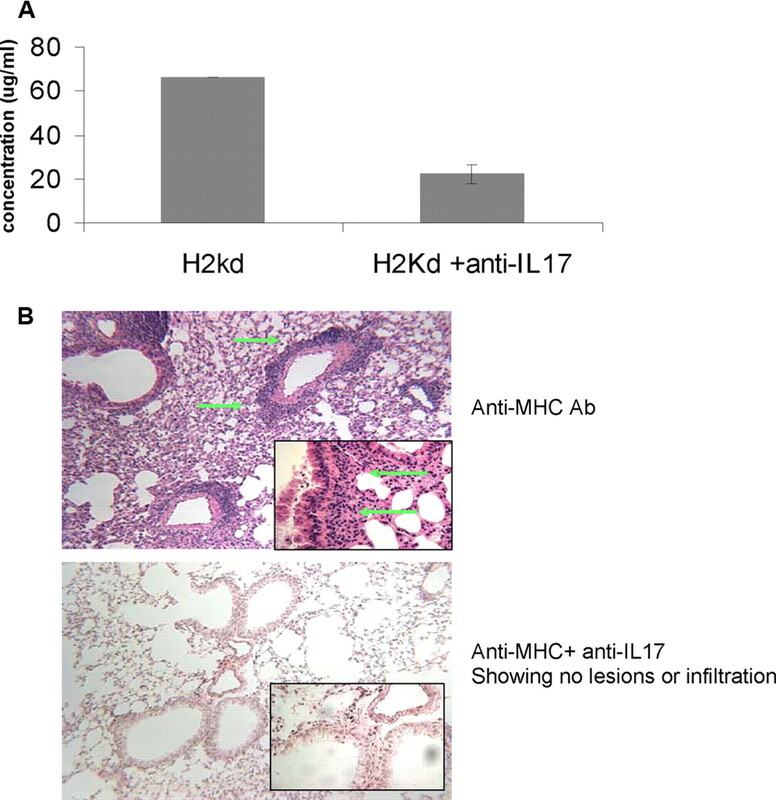 These results indicate that IL-17 plays a crucial role in the induction of autoimmunity following administration of anti-MHC class I Abs into the lung. Neutralization of IL-17 blocks the induction of autoimmune responses and development of bronchial occlusion. Anti-H2Kd or control Ab was administered endobronchially in BALB/c mice on days 1, 2, 3, and 6, and weekly thereafter. A total of 50 μg of neutralizing anti-IL-17 or control Abs was administered i.v. on days 1, 3, and 5, and weekly thereafter (n = 5 each). Serum and lungs of these mice were harvested on day 30 and analyzed for the development of autoantibodies and histopathological analysis. A, Quantitation of the anti-tubulin Abs by ELISA showed a 3-fold reduction in the concentrations of anti-tubulin Abs in IL-17-neutralized mice compared with controls. B, H&E staining of the lungs showed a significant reduction in T cell infiltration and bronchial occlusion similar to that observed in control mice treated with isotype control Ab. Understanding the mechanisms for the immunopathogenesis of chronic allograft rejection remains a major goal toward improving the long-term success of transplanted organs. There is considerable evidence that alloimmune response against the mismatched MHC Ags plays a pivotal role in the pathogenesis of chronic rejection (26). In the past, it was presumed that mostly T cell immune responses, including direct cytotoxicity of the organ (27) or indirect Ag presentation of the mismatched allopeptides (28) resulting in both cytokine-mediated (23) and alloantibody complement-mediated damage of the organ (29), played a significant role in the pathogenesis of chronic rejection. There is emerging evidence for an important role for alloantibodies in the pathogenesis of chronic rejection of kidneys (6), heart (7), and lung (8). Previous studies from our laboratory have also shown not only a significant correlation between the development of Abs during the posttransplant period, but also the emergence of detectable anti-HLA Abs months before the onset of BOS following LTx (30). It has been demonstrated that anti-MHC class I Ab binding to the endothelial lining or to the epithelial surface can activate signaling cascades resulting in growth factor production, leading to fibrosis and occlusion, a cardinal feature of all chronic rejection (31, 32). However, persistence of detectable anti-MHC alloantibodies is not a general feature in allograft recipients undergoing chronic rejection (33), and there is controversy that the presence of Abs during the posttransplant period is merely a marker for other immunological events occurring. In this communication, we present evidence that alloantibody binding leads to autoantibody production, which is responsible for the pathogenesis of chronic rejection. We provide evidence for the first time that anti-MHC class I Ab binding to the lung parenchyma results in cellular infiltration of the lung, resulting in endotheliitis and epithelial hyperplasia, leading to autoantibody production of two epithelial self-Ags, i.e., ColV and K-α1 tubulin. In an allograft, all of the Abs directed to the mismatched MHC Ags will have the capacity to bind to the allograft. To mimic this, we directly administered anti-MHC class I Ab to the lung via endobronchial route. Therefore, we believe that most, if not all, of the Abs will have a chance to bind and saturate the lung MHC molecules before getting into the circulation. This assumption turned out to be valid because we found lesions in the lung and not in other organs. Specificity of the MHC Abs to cause the lesion was confirmed because isotype-matched C1.18.4 Abs failed to cause the lesions (Fig. 1⇑, B, E, H, and K). In addition, we also did not see any lesions when Abs to keratin, which binds to the epithelial cell surface, were administered endobronchially (Fig. 1⇑, C, F, I, and L). Therefore, Ab binding alone was not sufficient to induce the lesion, and specificity to MHC class I was required. Moreover, similar lesions were observed in the C57BL/6 mice and the HLA-A2 transgenic C57BL/6 mice following administration of anti-H2Kb and W6/32 Ab, respectively, with a similar kinetics demonstrating that the observation is independent of strain and Ab. Therefore, the data presented in this study along with the earlier findings (32) indicate that anti-donor MHC Abs developed during the posttransplant period will bind specifically to the allograft, resulting in the lesions seen in chronic rejection. Cellular infiltration into the lung 15 days following treatment with anti-MHC class I Ab was impressive. Initial infiltration was noted around the small vessels, leading to endotheliitis (Fig. 1⇑A). This is consistent with the reports demonstrating that endotheliitis precedes clinical signs of chronic rejection in human LTx recipients (34). Analysis of the chemokine expression in the lungs by quantitative real-time PCR demonstrated a significant increase in the expression of several chemokines (CCL9, 9.2-fold; CCR2, 10.6-fold; CXCL1, 6.3-fold; and CXCL12, 8.0-fold). CCL9 is a member of the CC motif chemokine ligand that is expressed by the epithelial cells and plays a critical role in mucosal immunity, tissue homeostasis (35), and recruitment of dendritic cells (36). CCL9 through its receptor CCR1 has been shown to play a role in induction of autoimmunity as well as in transplant rejection (37). CCR2, a monocyte chemoattractant, has also been shown to be expressed in the lung epithelial cells and is thought to be involved in IL-13-mediated pathogenesis as well as in lung re-epithelialization following injury (38). Studies in experimental animal model have also shown that CCR2 plays a crucial role in recruitment of the leukocytes in the lung and contributes to rejection and development of BOS (39). CXCL12 has been shown to be critically involved in the GC formation, especially in response to self-Ags (22). Based on our findings of up-regulation of several chemokines and their receptors (Fig. 4⇑A) following administration of anti-MHC class I, it is reasonable to assume that anti-MHC class I binding induces the signals for infiltration of inflammatory cells into the organ, which begins at the endothelial parenchymal junction. Alloimmune response to mismatched HLA Ags has been considered to be the primary insult leading to chronic rejection following human LTx (40). Frequency of indirect Ag presentation of the allo-MHC peptides has been shown to be increased in patients undergoing chronic rejection (26). In addition, Abs to mismatched HLA Ags have been demonstrated in patients with BOS (5), and more significantly, precede the development of clinical evidence of BOS (8, 30). Surprisingly, many patients with BOS have no detectable Abs to mismatched HLA Ags, giving rise to the possibility that immune responses to non-HLA Ags may play a significant role in the pathogenesis of BOS. Our results clearly demonstrate that anti-MHC class I Abs developed during the posttransplant period upon binding to the organ expose otherwise cryptic determinants on self-Ags, leading to immune responses against them. Data presented in this study (Fig. 4⇑C) also indicate that these autoantibodies can bind to the epithelial cells and other cells and activate them to produce bone morphogenetic protein (BMP), fibroblast growth factor (FGF) family of growth factors that may play an important role in the pathogenesis of BOS. These results are consistent with the notion that autoantibodies play a significant role in the pathogenesis of chronic rejection (10), as reported for a role for cardiac myosin and vimentin in the pathogenesis of coronary artery diseases following heart transplantation (13, 41). There is also strong evidence for autoreactivity to ColV in the pathogenesis of chronic rejection following human LTx (19), as well as animal models of lung allograft rejection (15). Both direct and indirect allorecognition pathways have been shown to contribute to rejection following transplantation (42). Studies analyzing the immune responses to self-Ags following transplantation have clearly demonstrated that the indirect allorecognition pathway plays a crucial role (15, 43). Moreover, studies in the chronic lung disease models have shown that there is an increase in the frequency of the B cells in the lung following chronic injury, and the B cells can provide help to the T cells by acting as APCs (44). Our preliminary analysis of the cells infiltrating the lung indicates that they are activated and secrete IFN-γ, IL-4, as well as IL-17 (Fig. 3⇑). In vitro studies demonstrate that this population consists of cells responding to K-α1 tubulin as well as ColV. It is of interest that the autoantigen ColV has been shown to participate in human and animal models of lung allograft rejection (16, 43, 45, 46). This was followed by the development of Abs to both of these autoantigens. It is of interest that cells infiltrating the lung produced large amounts of IL-17 following stimulation with both K-α1 tubulin and ColV (Fig. 3⇑). IL-17 has been shown to be a potent proinflammatory cytokine that acts on epithelial cells, ECs, fibrocytes, and stromal cells, leading to a proinflammatory signal that results in enhanced proinflammatory cytokine and chemokine secretion (17). IL-17 has also been shown to play a crucial role in the induction of humoral autoimmune responses (18). Analysis of the T cell responses to ColV in LTx recipients has been shown to be dependent on CD4 T cells and monocytes (19). This response was found to be dependent on IL-17, TNF-α, and IL-1β. The risk of BOS development was observed to correlate with the severity of the ColV-specific T cell responses (19). Furthermore, in this study, it was also shown that the interaction between IL-17 and monocytes is crucial in induction of the ColV-specific responses. IL-17 has also been shown to play a crucial role in the formation of GCs and to regulate the movement of the B cells in the GCs through chemokine CXCL12 and CXCL13 (22). Studies have also demonstrated that a deficiency in the IL-17 or blocking of IL-17 results in a decrease in the production of autoantibodies (20, 21). Therefore, our finding of IL-17-producing T cells following stimulation with self-Ags indicates that these T cells provide signals toward activation of B cells, resulting in Abs to self-Ags, such as K-α1 tubulin and ColV. Moreover, as shown in Fig. 6⇑A, neutralization of IL-17 resulted in a significant reduction in the levels of Abs to the self-Ag K-α1 tubulin. More significantly, neutralization of IL-17 also resulted in abrogation of all of the lesions induced by anti-MHC class I Abs, i.e., a decreased cellular infiltration, epithelial hyperplasia, and fibrosis in the lungs following administration of anti-MHC class I Abs. These observations are in agreement with the report that in IL-17-deficient mice, lack of IL-17 signaling significantly reduces the induction of autoimmunity and down modulates the formation of GCs leading to a reduction in the titer of autoantibodies (22). Hence, we propose that IL-17 is a critical mediator in the induction of autoimmunity following ligation of the anti-MHC class I Abs, resulting in the development of chronic rejection following LTx. By day 30 post-Ab administration, we also noted marked epithelial hyperplasia (Fig. 1⇑), which is similar to that seen in BOS. Increased growth factor production in the lung milieu was also noted at this period. These changes eventually lead to increased fibrosis and luminal occlusion of the small airway (Fig. 1⇑J). Analysis of the profile of the growth factor produced in the lungs showed a significant increase in the expression of FGF and BMP family of proteins (Fig. 4⇑C). Earlier in vitro studies from our laboratory as well as others have demonstrated that binding of the anti-MHC class I Abs to the epithelial cells as well as the ECs produces significantly high quantities of several growth factors, including epithelial growth factor, basic FGF, platelet-derived growth factor, TGF-β (32, 47, 48, 49, 50), and GM-CSF (51). Studies in the literature have also shown that the BMP family of proteins acts upstream of FGF to regulate T cell development and epithelial remodeling in the lungs. BMP has been shown to up-regulate adhesion molecule expression in the ECs and a critical inflammatory signal in atherogenic lesions. These changes eventually lead to increased fibrosis and luminal occlusion (Fig. 1⇑J). All of these changes are consistent with the hypothesis that anti-MHC class I Abs can induce autoimmune response, which leads to autoantibody production to self-Ags. We postulate that not only Abs to donor MHC, but also cellular immune responses to mismatched donor MHC as well as viral infections of the respiratory tract can result in damage to the airway epithelial cells, leading to exposure of otherwise cryptic determinants of self-Ags, including K-α1 tubulin and ColV. This can result in Ab production to these autoantigens, which then can induce chronic stimuli of the endothelium and epithelium of the lung parenchyma, resulting in various growth factor production that is necessary for inducing epithelial hyperplasia and fibrosis of the lung parenchyma, leading to luminal occlusion. This fits well with our current dogma that the number of acute cellular rejection episodes (52, 53) and number of upper respiratory viral infections (54) correlate with incidence of chronic rejection following human LTx. Based on our observations, we propose that ligation of the anti-MHC class I Ab to MHC molecules on epithelial cells and ECs results in the increased expression of CXCL12 and CCL9, which signal through CCR2 and CXCR4, resulting in increased leukocyte infiltration in the lungs and exposure of cryptic determinants of self-Ags, leading to an increased frequency of autoreactive Th17 T cells. The Th17 T cells in combination with CXCL12 lead to increase in response to self-Ags, resulting in autoantibody production. Therefore, neutralization of IL-17 can be a viable therapeutic option that could prevent the induction of autoimmunity and development of chronic rejection. Direct activation of the epithelial cells and ECs by both Abs to MHC Ags as well as self-Ags can also result in the increased expression of fibrogenic growth factors and proliferation, the hallmarks of chronic allograft rejection. Therefore, we provide evidence for the first time that autoimmunity that is induced by Ab ligation of MHC class I molecule plays an important role in the pathogenesis of chronic rejection following LTx. We are currently testing the hypothesis that prevention of development of autoimmunity by early recognition and control of alloimmune responses or viral infections have the potential to prevent development of chronic rejection following human lung transplantation. We thank Billie Glasscock for her assistance in preparing this manuscript. ↵1 This work was supported by National Institutes of Health Grant HL66452 (to T.M.) from National Heart, Lung, and Blood Institute, and the contents are solely the responsibility of the authors and do not necessarily represent the official views of the National Heart, Lung, and Blood Institute. ↵3 Abbreviations used in this paper: LTx, lung transplantation; BMP, bone morphogenetic protein; BOS, bronchiolitis obliterans syndrome; ColV, collagen V; EC, endothelial cell; FGF, fibroblast growth factor; GC, germinal center; HSP-60, heat shock protein 60; O/N, overnight; RT, room temperature. Trulock, E. P., L. B. Edwards, D. O. Taylor, M. M. Boucek, P. J. Mohacsi, B. M. Keck, M. I. Hertz. 2003. The Registry of the International Society for Heart and Lung Transplantation: twentieth official adult lung and heart-lung transplant report, 2003. J. Heart Lung Transplant. 22: 625-635. Griffith, B. P., I. L. Paradis, A. Zeevi, H. Rabinowich, S. A. Yousem, R. J. Duquesnoy, J. H. Dauber, R. L. Hardesty. 1988. Immunologically mediated disease of the airways after pulmonary transplantation. Ann. Surg. 208: 371-378. Boehler, A., M. Estenne. 2000. Obliterative bronchiolitis after lung transplantation. Curr. Opin. Pulm. Med. 6: 133-139. Suciu-Foca, N., E. Reed, V. D. D'Agati, E. Ho, D. J. Cohen, A. I. Benvenisty, R. McCabe, J. M. Brensilver, D. W. King, M. A. Hardy. 1991. Soluble HLA antigens, anti-HLA antibodies, and antiidiotypic antibodies in the circulation of renal transplant recipients. Transplantation 51: 593-601. Smith, M. A., S. Sundaresan, T. Mohanakumar, E. P. Trulock, J. P. Lynch, D. L. Phelan, J. D. Cooper, G. A. Patterson. 1998. Effect of development of antibodies to HLA and cytomegalovirus mismatch on lung transplantation survival and development of bronchiolitis obliterans syndrome. J. Thorac. Cardiovasc. Surg. 116: 812-820. Mizutani, K.. 2005. Serial ten-year follow-up of HLA and MICA antibody production prior to kidney graft failure. Am. J. Transplant. 5: 1-8. Reed, E. F., B. Hong, E. Ho, P. E. Harris, J. Weinberger, N. Suciu-Foca. 1996. Monitoring of soluble HLA alloantigens and anti-HLA antibodies identifies heart allograft recipients at risk of transplant-associated coronary artery disease. Transplantation 61: 566-572. Sundaresan, S., T. Mohanakumar, M. A. Smith, E. P. Trulock, J. Lynch, D. Phelan, J. D. Cooper, G. A. Patterson. 1998. HLA-A locus mismatches and development of antibodies to HLA after lung transplantation correlate with the development of bronchiolitis obliterans syndrome. Transplantation 65: 648-653. Fedoseyeva, E. V., F. Zhang, P. L. Orr, D. Levin, H. J. Buncke, G. Benichou. 1999. De novo autoimmunity to cardiac myosin after heart transplantation and its contribution to the rejection process. J. Immunol. 162: 6836-6842. Benichou, G., A. Alessandrini, R. S. Charrad, D. S. Wilkes. 2007. Induction of autoimmunity after allotransplantation. Front. Biosci. 12: 4362-4369. Barber, L. D., A. Whitelegg, J. A. Madrigal, N. R. Banner, M. L. Rose. 2004. Detection of vimentin-specific autoreactive CD8+ T cells in cardiac transplant patients. Transplantation 77: 1604-1609. Caldas, C., E. Luna, M. Spadafora-Ferreira, G. Porto, L. K. Iwai, S. E. Oshiro, S. M. Monteiro, J. A. Fonseca, F. Lemos, J. Hammer, et al 2006. Cellular autoreactivity against heat shock protein 60 in renal transplant patients: peripheral and graft-infiltrating responses. Clin. Exp. Immunol. 146: 66-75. Tanaka, M., M. Zwierzchoniewska, G. K. Mokhtari, R. D. Terry, L. B. Balsam, R. C. Robbins, E. V. Fedoseyeva. 2005. Progression of alloresponse and tissue-specific immunity during graft coronary artery disease. Am. J. Transplant. 5: 1286-1296. Rolls, H. K., K. Kishimoto, V. M. Dong, B. M. Illigens, M. Sho, M. H. Sayegh, G. Benichou, E. V. Fedoseyeva. 2002. T-cell response to cardiac myosin persists in the absence of an alloimmune response in recipients with chronic cardiac allograft rejection. Transplantation 74: 1053-1057. Haque, M. A., T. Mizobuchi, K. Yasufuku, T. Fujisawa, R. R. Brutkiewicz, Y. Zheng, K. Woods, G. N. Smith, O. W. Cummings, K. M. Heidler, et al 2002. Evidence for immune responses to a self-antigen in lung transplantation: role of type V collagen-specific T cells in the pathogenesis of lung allograft rejection. J. Immunol. 169: 1542-1549. Yoshida, S., A. Haque, T. Mizobuchi, T. Iwata, M. Chiyo, T. J. Webb, L. A. Baldridge, K. M. Heidler, O. W. Cummings, T. Fujisawa, et al 2006. Anti-type V collagen lymphocytes that express IL-17 and IL-23 induce rejection pathology in fresh and well-healed lung transplants. Am. J. Transplant. 6: 724-735. Jovanovic, D. V., J. A. Di Battista, J. Martel-Pelletier, F. C. Jolicoeur, Y. He, M. Zhang, F. Mineau, J. P. Pelletier. 1998. IL-17 stimulates the production and expression of proinflammatory cytokines, IL-β and TNF-α, by human macrophages. J. Immunol. 160: 3513-3521. Irmler, I. M., M. Gajda, R. Brauer. 2007. Exacerbation of antigen-induced arthritis in IFN-γ-deficient mice as a result of unrestricted IL-17 response. J. Immunol. 179: 6228-6236. Burlingham, W. J., R. B. Love, E. Jankowska-Gan, L. D. Haynes, Q. Xu, J. L. Bobadilla, K. C. Meyer, M. S. Hayney, R. K. Braun, D. S. Greenspan, et al 2007. IL-17-dependent cellular immunity to collagen type V predisposes to obliterative bronchiolitis in human lung transplants. J. Clin. Invest. 117: 3498-3506. Tang, J. L., V. M. Subbotin, M. A. Antonysamy, A. B. Troutt, A. S. Rao, A. W. Thomson. 2001. Interleukin-17 antagonism inhibits acute but not chronic vascular rejection. Transplantation 72: 348-350. Sonderegger, I., T. A. Rohn, M. O. Kurrer, G. Iezzi, Y. Zou, R. A. Kastelein, M. F. Bachmann, M. Kopf. 2006. Neutralization of IL-17 by active vaccination inhibits IL-23-dependent autoimmune myocarditis. Eur. J. Immunol. 36: 2849-2856. Hsu, H. C., P. Yang, J. Wang, Q. Wu, R. Myers, J. Chen, J. Yi, T. Guentert, A. Tousson, A. L. Stanus, et al 2008. Interleukin 17-producing T helper cells and interleukin 17 orchestrate autoreactive germinal center development in autoimmune BXD2 mice. Nat. Immunol. 9: 166-175. Bharat, A., K. Narayanan, T. Street, R. C. Fields, N. Steward, A. Aloush, B. Meyers, R. Schuessler, E. P. Trulock, G. A. Patterson, T. Mohanakumar. 2007. Early posttransplant inflammation promotes the development of alloimmunity and chronic human lung allograft rejection. Transplantation 83: 150-158. Yamaguchi, Y., K. Fujio, H. Shoda, A. Okamoto, N. H. Tsuno, K. Takahashi, K. Yamamoto. 2007. IL-17B and IL-17C are associated with TNF-α production and contribute to the exacerbation of inflammatory arthritis. J. Immunol. 179: 7128-7136. Goers, T. A., S. Ramachandran, A. Aloush, E. Trulock, G. A. Patterson, T. Mohanakumar. 2008. De novo production of K-α1 tubulin-specific antibodies: role in chronic lung allograft rejection. J. Immunol. 180: 4487-4494. Kuo, E., T. Maruyama, F. Fernandez, T. Mohanakumar. 2005. Molecular mechanisms of chronic rejection following transplantation. Immunol. Res. 32: 179-185. Hornick, P. I., P. D. Mason, M. H. Yacoub, M. L. Rose, R. Batchelor, R. I. Lechler. 1998. Assessment of the contribution that direct allorecognition makes to the progression of chronic cardiac transplant rejection in humans. Circulation 97: 1257-1263. Chen, W., B. Murphy, A. M. Waaga, T. A. Willett, M. E. Russell, S. J. Khoury, M. H. Sayegh. 1996. Mechanisms of indirect allorecognition in graft rejection: class II MHC allopeptide-specific T cell clones transfer delayed-type hypersensitivity responses in vivo. Transplantation 62: 705-710. Smith, J. D., I. M. Hamour, N. R. Banner, M. L. Rose. 2007. C4d fixing, luminex binding antibodies: a new tool for prediction of graft failure after heart transplantation. Am. J. Transplant. 7: 2809-2815. Jaramillo, A., M. A. Smith, D. Phelan, S. Sundaresan, E. P. Trulock, J. P. Lynch, J. D. Cooper, G. A. Patterson, T. Mohanakumar. 1999. Development of ELISA-detected anti-HLA antibodies precedes the development of bronchiolitis obliterans syndrome and correlates with progressive decline in pulmonary function after lung transplantation. Transplantation 67: 1155-1161. Harris, P. E., H. Bian, E. F. Reed. 1997. Induction of high affinity fibroblast growth factor receptor expression and proliferation in human endothelial cells by anti-HLA antibodies: a possible mechanism for transplant atherosclerosis. J. Immunol. 159: 5697-5704. Jaramillo, A., C. R. Smith, T. Maruyama, L. Zhang, G. A. Patterson, T. Mohanakumar. 2003. Anti-HLA class I antibody binding to airway epithelial cells induces production of fibrogenic growth factors and apoptotic cell death: a possible mechanism for bronchiolitis obliterans syndrome. Hum. Immunol. 64: 521-529. McKenna, R. M., S. K. Takemoto, P. I. Terasaki. 2000. Anti-HLA antibodies after solid organ transplantation. Transplantation 69: 319-326. Luckraz, H., M. Goddard, K. McNeil, C. Atkinson, S. C. Charman, S. Stewart, J. Wallwork. 2004. Microvascular changes in small airways predispose to obliterative bronchiolitis after lung transplantation. J. Heart Lung Transplant. 23: 527-531. Shaykhiev, R., R. Bals. 2007. Interactions between epithelial cells and leukocytes in immunity and tissue homeostasis. J. Leukocyte Biol. 82: 1-15. Zhao, X., A. Sato, C. S. Dela Cruz, M. Linehan, A. Luegering, T. Kucharzik, A. K. Shirakawa, G. Marquez, J. M. Farber, I. Williams, A. Iwasaki. 2003. CCL9 is secreted by the follicle-associated epithelium and recruits dome region Peyer’s patch CD11b+ dendritic cells. J. Immunol. 171: 2797-2803. Horuk, R.. 2005. BX471: a CCR1 antagonist with anti-inflammatory activity in man. Mini Rev. Med. Chem. 5: 791-804. Zhu, Z., B. Ma, T. Zheng, R. J. Homer, C. G. Lee, I. F. Charo, P. Noble, J. A. Elias. 2002. IL-13-induced chemokine responses in the lung: role of CCR2 in the pathogenesis of IL-13-induced inflammation and remodeling. J. Immunol. 168: 2953-2962. Belperio, J. A., M. P. Keane, M. D. Burdick, J. P. Lynch, III, Y. Y. Xue, A. Berlin, D. J. Ross, S. L. Kunkel, I. F. Charo, R. M. Strieter. 2001. Critical role for the chemokine MCP-1/CCR2 in the pathogenesis of bronchiolitis obliterans syndrome. J. Clin. Invest. 108: 547-556. Finn, O. J., L. A. Debruyne, D. K. Bishop. 1996. T cell receptor (TCR) repertoire in alloimmune responses. Int. Rev. Immunol. 13: 187-207. Azimzadeh, A. M., S. Pfeiffer, G. S. Wu, C. Schroder, H. Zhou, G. L. Zorn, III, M. Kehry, G. G. Miller, M. L. Rose, R. N. Pierson, III. 2005. Humoral immunity to vimentin is associated with cardiac allograft injury in nonhuman primates. Am. J. Transplant. 5: 2349-2359. Waanders, M. M., S. Heidt, K. M. Koekkoek, Y. M. Zoet, I. I. Doxiadis, A. Amir, M. H. Heemskerk, A. Mulder, A. Brand, D. L. Roelen, F. H. Claas. 2008. Monitoring of indirect allorecognition: wishful thinking or solid data?. Tissue Antigens 71: 1-15. Sumpter, T. L., D. S. Wilkes. 2004. Role of autoimmunity in organ allograft rejection: a focus on immunity to type V collagen in the pathogenesis of lung transplant rejection. Am. J. Physiol. 286: L1129-L1139. Bharat, A., R. C. Fields, N. Steward, E. P. Trulock, G. A. Patterson, T. Mohanakumar. 2006. 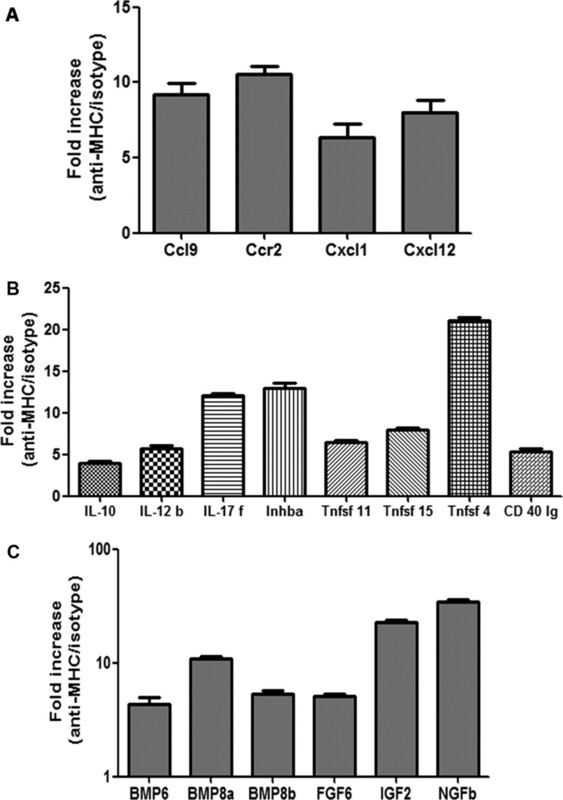 CD4+25+ regulatory T cells limit Th1-autoimmunity by inducing IL-10 producing T cells following human lung transplantation. Am. J. Transplant. 6: 1799-1808. Wilkes, D. S.. 2003. The role of autoimmunity in the pathogenesis of lung allograft rejection. Arch. Immunol. Ther. Exp. 51: 227-230. Mauck, K. A., J. D. Hosenpud. 1996. The bronchial epithelium: a potential allogeneic target for chronic rejection after lung transplantation. J. Heart Lung Transplant. 15: 709-714. Zhao, J., P. J. Sime, P. Bringas, J. Gauldie, D. Warburton. 1998. Epithelium-specific adenoviral transfer of a dominant-negative mutant TGF-β type II receptor stimulates embryonic lung branching morphogenesis in culture and potentiates EGF and PDGF-AA. Mech. Dev. 72: 89-100. Wagner, C. R., T. E. Morris, G. D. Shipley, J. D. Hosenpud. 1993. Regulation of human aortic endothelial cell-derived mesenchymal growth factors by allogeneic lymphocytes in vitro: a potential mechanism for cardiac allograft vasculopathy. J. Clin. Invest. 92: 1269-1277. O'Brien, A. D., T. J. Standiford, P. J. Christensen, S. E. Wilcoxen, R. Paine. 1998. Chemotaxis of alveolar macrophages in response to signals derived from alveolar epithelial cells. J. Lab. Clin. Med. 131: 417-424. Marini, M., M. Soloperto, M. Mezzetti, A. Fasoli, S. Mattoli. 1991. Interleukin-1 binds to specific receptors on human bronchial epithelial cells and up-regulates granulocyte/macrophage colony-stimulating factor synthesis and release. Am. J. Respir. Cell Mol. Biol. 4: 519-524. Hachem, R. R., A. P. Khalifah, M. M. Chakinala, R. D. Yusen, A. A. Aloush, T. Mohanakumar, G. A. Patterson, E. P. Trulock, M. J. Walter. 2005. The significance of a single episode of minimal acute rejection after lung transplantation. Transplantation 80: 1406-1413. Khalifah, A. P., R. R. Hachem, M. M. Chakinala, R. D. Yusen, A. Aloush, G. A. Patterson, T. Mohanakumar, E. P. Trulock, M. J. Walter. 2005. Minimal acute rejection after lung transplantation: a risk for bronchiolitis obliterans syndrome. Am. J. Transplant. 5: 2022-2030. Khalifah, A. P., R. R. Hachem, M. M. Chakinala, K. B. Schechtman, G. A. Patterson, D. P. Schuster, T. Mohanakumar, E. P. Trulock, M. J. Walter. 2004. Respiratory viral infections are a distinct risk for bronchiolitis obliterans syndrome and death. Am. J. Respir. Crit. Care Med. 170: 181-187.